Falafel are (is?) extremely easy to make! 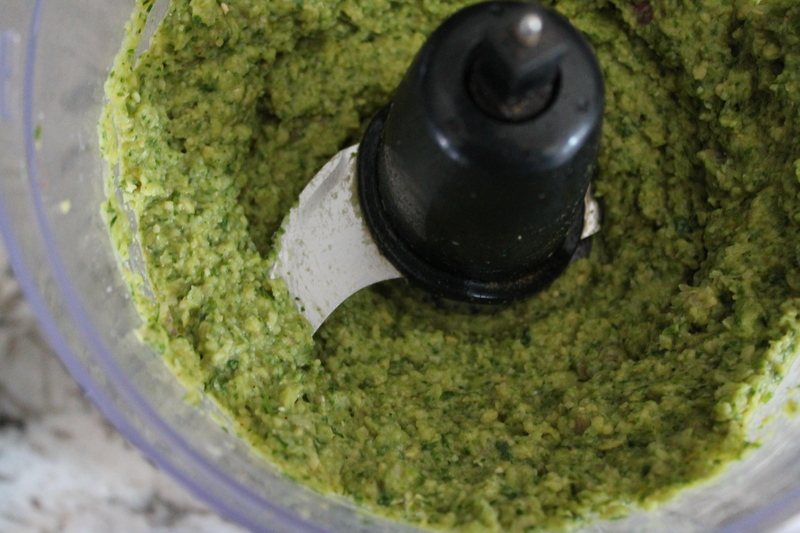 You basically need a food processor and a bunch of healthy ingredients. Good start! Roughly chop a shallot or onion and peel a bunch of cloves of garlic. in my opinion, the more garlic the better. Chunk all of the ingredients for the falafel patties into the food processor: chickpeas, a whole mess of cilantro and parsley (you can tinker with the ratios, but I prefer an even balance so the taste isn’t too grassy), garlic, onion, flour, lemon juice, seasonings, and baking powder. Sometimes I like to do the produce first and add the flour and seasonings last, just to make sure everything gets broken up but the flour doesn’t get overworked and make the falafel dry or tough. Process until the mixture is even and not too chunky. Chill for 2 hours. 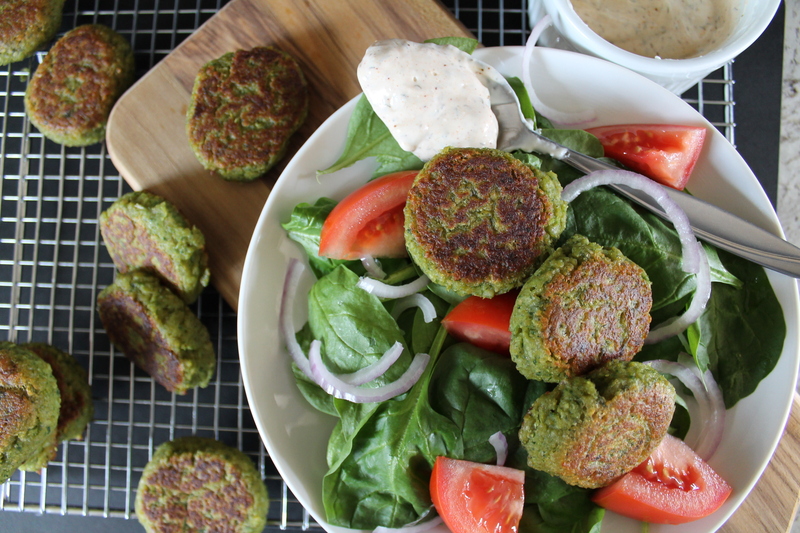 If you’re in a huge rush, you can skip the chilling, but the falafel mixture will be quite sticky and messy if you do. Plus, the chilling gives the flavors a little time to meld together. Scoop the mixture into small balls, about 2″ in diameter. Flatten slightly on a sheet of parchment or a Silpat. 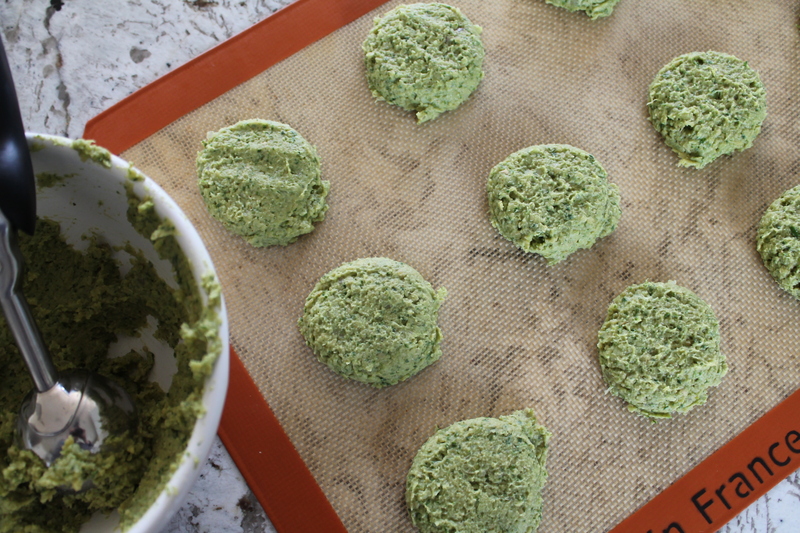 I worked mine in batches: after I formed about 12 patties, I found that the chickpea mixture was getting a bit sticky again, so I just chilled the rest for later. Now we just pan-fry these babies in a small amount of oil! Use just enough oil to coat the bottom of a heavy skillet and fry several at a time, about 2 minutes per side, until dark and firm. I like to freeze what I can’t eat right away, formed into patties but uncooked, then fry them up as I am ready to enjoy them! Falafel are aways best when fresh. You can serve these any number of ways. I, personally, prefer to layer a few patties in a pita pocket (which I sincerely believe was invented by busy moms) with some fresh spinach, tomato, red onion, and spicy tzatziki! Yum. You can make your own tzatziki or buy it in the produce section of the grocery store. 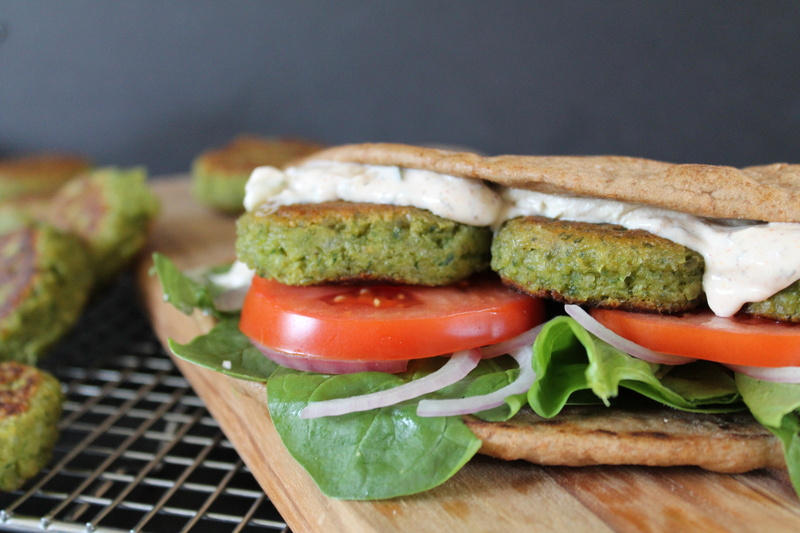 To keep it totally vegan, skip the tzatziki and use a little hummus or a tahini drizzle instead! 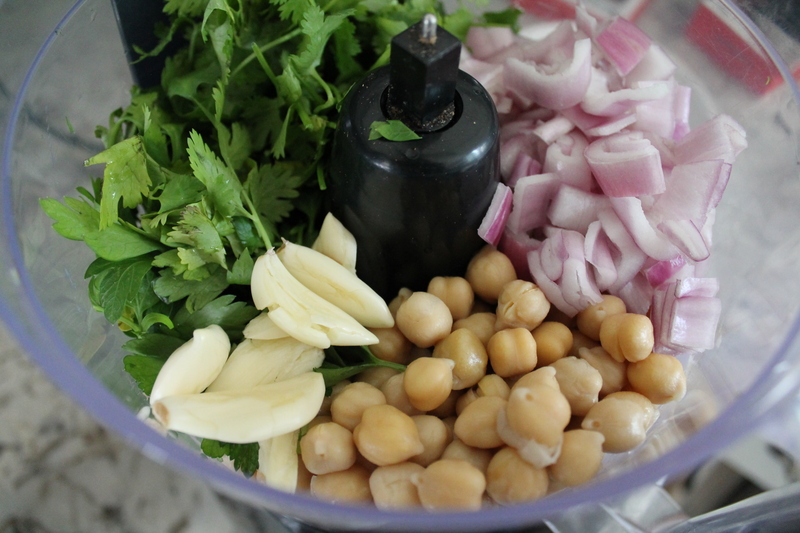 Combine the onion, garlic, chickpeas, and fresh herbs in a food processor. Pulse until the beans and greens are broken down. Scrape the sides of the bowl. Add the flour, lemon juice, seasonings, and baking powder. Pulse until evenly mixed. Cover the food processor bowl and chill for 2 hours. 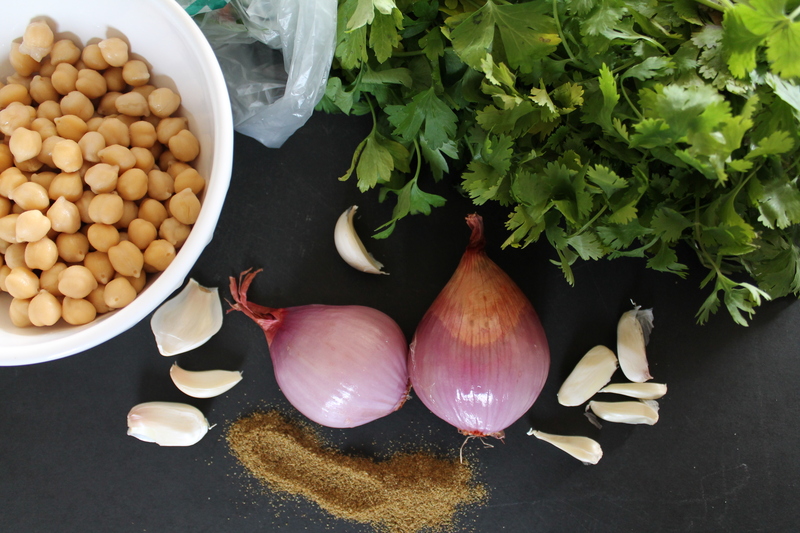 When ready to fry the falafel, pull the chickpea mixture out of the fridge. Scoop into 2″ balls and flatten slightly. Place the patties on a silicon mat or sheet of parchment. 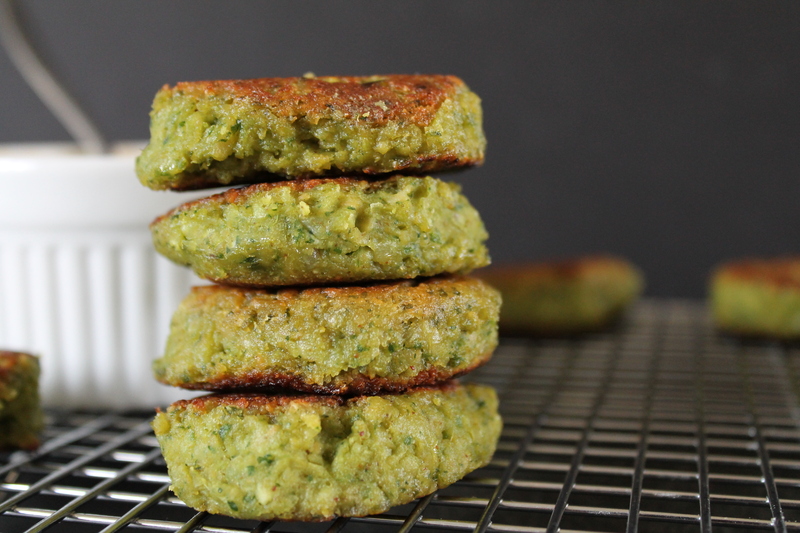 If the chickpea mixture gets too sticky, chill it again while frying the first batch or two of falafel patties. Heat about 2 tbsp. oil in a large, heavy-bottomed skillet. 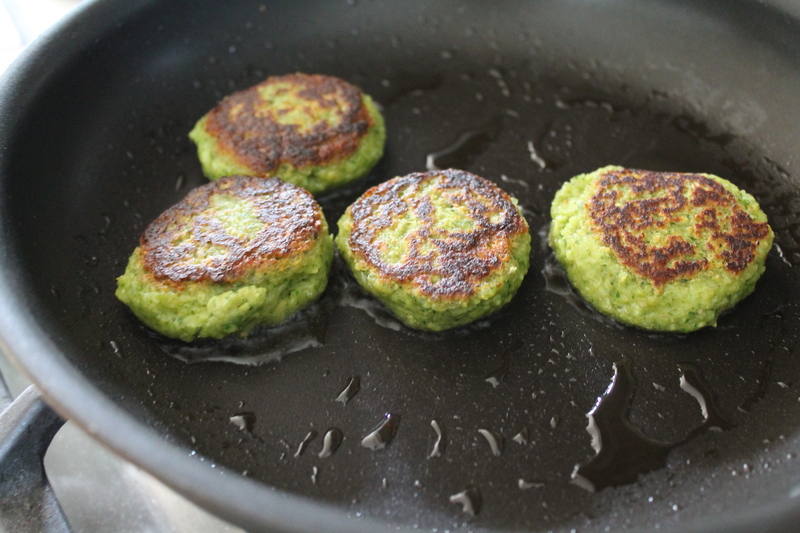 When very hot but not smoking, add several falafel patties, ensuring that they do not touch each other. Cook for 2–3 minutes, until dark brown on the bottom, then flip and cook another 2 minutes. Serve the falafel warm with desired accompaniments, such as: torn greens, thinly sliced tomato and red onion, drizzled with spicy tzatziki or tahini and a little lemon juice, wrapped in pita bread. Haha, thanks! Hope you enjoy it! I’m so sorry about your day! That sounds awful!! The falafel looks gorgeous, though, grace under pressure! This looks amazingly delicious — salivating here! So for freezing, do you just put the patties in a bag and into the freezer, or should it be flash-frozen (sitting on a cookie sheet in the freezer for an hour-ish?) then put in together in a bag? I’m guessing the second but didn’t want to dry them out too much. 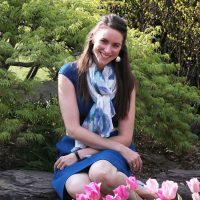 Thanks Jess! I usually flash freeze so they don’t stick together. If you are worried they will be dry when you reheat, you could warm them in the pan with an extra dab of oil. Good luck!